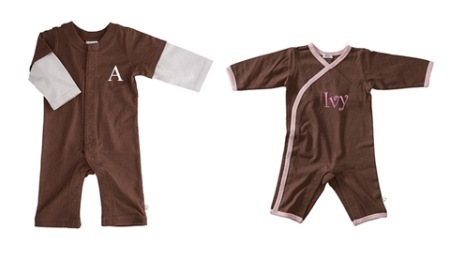 Personalized baby clothing makes a really great, unique, and yet practical baby shower gift. There are so many ways to personalize baby clothes. You can have it silk screened with personalized names, dates, or logos and pictures. You can have your baby clothes appliqued or even embroidered. Expecting couples and moms-to-be will appreciate the extra effort you put in to choosing their baby gift. Your gift will be a one-of-a-kind at the baby shower! These personalized onesies from Dimples and Dandelions are super unique an so cute. The perfect baby shower gift! They can be personalized with the family name, or the happy couple's first names with cute sayings such like "copyright 2010 Smith Family" or "A Mark and Tina Production". They even have onesies for twins; "A Mark and Tina Production", "1 of 2" & "2 of 2". There are also sibling onesies, personalized name onesies and more. 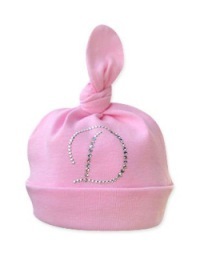 I love these personalized baby hats emblazoned with baby's initials. So Adorable! You can find these at The Frog and Princess. Pick up a matching personalized baby tee and tutu while you are at it! This embroidered sweat suit is sure to be a scene stealer at any baby shower. 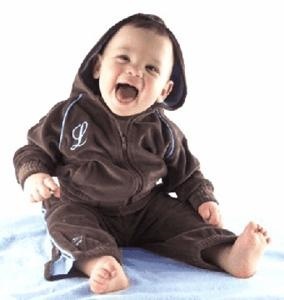 This sweat suit can be found at GoToBaby.com and is embroidered with an initial on the front and a name across the sleeve. A fantastic baby gift! Another embroidered baby clothing option. This one piece baby suit is super cute and available in borwn or tea green. So soft and cute! There is also a kimono one piece suit that is perfect for a little girl. It also comes personalized with an embroidered initial. Fit for a little prince or princess, this personalized baby gown and cap is a sweet and comfy baby shower gift. You can find these, and many other personalized clothes and gift options at MyMiracleBaby.com.